Habit: Perennial herb, glandular; odor resinous. Leaf: generally basal, odd-1-pinnately compound, generally +- cylindric; cauline generally alternate, reduced; leaflets 4--80 per side, generally overlapped, generally divided +- to base. Inflorescence: cyme; pedicel bractlets 0. 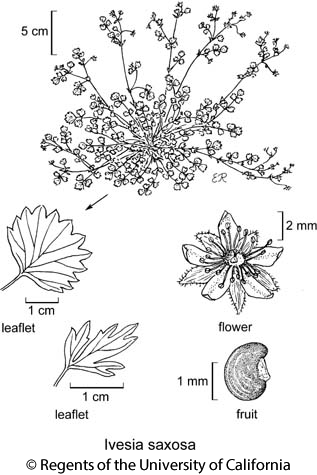 Flower: receptacle generally not stalked; hypanthium shallow or deep, bractlets (0)5, generally < sepals; petals generally 5, 1--5(7) mm, linear to obovate or round, acute to rounded; stamens 5--20(40), filaments generally thread-like; pistils 1--8(20), ovary superior, style attached below fruit tip, base +- rough-thickened. Fruit: achene. Species In Genus: 30 species: western North America. Etymology: (Eli Ives, Yale University, Connecticut pharmacologist, 1779--1861) Note: Leaf, leaflet data for basal leaves. Habit: Plants hanging clumps, green. Stem: 5--30 cm. Leaf: generally 5--15 cm, flat; sheathing bases +- glabrous; leaflets 2--4 per side, separated, generally 5--15 mm, +- round, evenly shallow-toothed to unevenly lobed +- to base; cauline leaves 2--4. Inflorescence: open, few- to many-flowered; pedicels 7--30 mm, generally +- S-shaped in fruit. Flower: 7--10 mm wide; hypanthium length < 1/2 width; petals 2--4 mm, < sepals, oblanceolate to obovate, yellow; stamens 15--40; pistils 3--20. Fruit: 1--1.5 mm, +- ridged, pale. Citation for this treatment: Barbara Ertter 2012, Ivesia saxosa, in Jepson Flora Project (eds.) Jepson eFlora, http://ucjeps.berkeley.edu/eflora/eflora_display.php?tid=29469, accessed on April 19, 2019.
s SNH, SnBr, PR, SNE, DMtns; Markers link to CCH specimen records. Yellow markers indicate records that may provide evidence for eFlora range revision or may have georeferencing or identification issues. Purple markers indicate specimens collected from a garden, greenhouse, or other non-wild location.